Recently, I have been learning a lot of good things about Selenium. 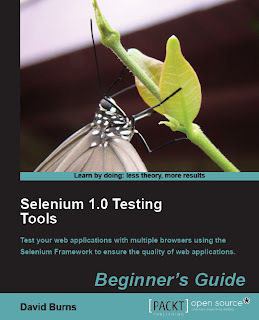 All thanks to this book, Selenium 1.0 Testing Tools - Beginner's Guide. I got an opportunity to review this book from PACKT Publishing. I have just started reading the book, but I can tell you one thing, it gives great start at working with Selenium. Selenium is an opensource automated testing tool for testing web application. Using Selenium we can write test cases to test the web application in a black box environment. Test automation has grown in popularity over the years because teams do not have the time or money to invest in large test teams to make sure that applications work as they are expected to. Developers want to make sure that the code they have created works as they expect it to. As time has passed developers and QA's have realized that automated functional tests provide a great safety net for catching bugs early in development life-cycle. Selenium makes writing/executing functional tests extremely easily. We can record and playback the tests directly in firefox using the Slenium IDE! Selenium also provides programming api to write functional tests in Java, C#, Ruby , PHP, Perl and Python. Once the tests are written (using the programming API or Selenium IDE) they can be execute as often as one wants using the Selenium RC (remote control) or Selenium Grid! Over and above it the test can be executed in variety of browsers including IE, Firefox, Opera and Safari! Selenium can be used to simulate any work flow. I have been in situations where, because the team had written Selenium tests, a bug was caught early in the development life-cycle, which would otherwise be caught very late. End result lot of time and money was saved because of Selenium! The things I am blabbering (about Selenium) in this post are covered in much greater detail in the book. Simply by reading the first few pages I was able to write a functional test using Selenium IDE. Starts from basics. The book starts of by guiding users through the installation process of Selenium IDE. Goes on to explain how to write a simple functional test (using Selenium IDE), with an example. Easy to read. Its very important that books are written in simple language so that everyone can read it easily. People with/without programming background can read this book with equal ease and extract useful information out of it. All concepts are explained using examples and lots of screen shots. These are just initial impressions about the book. I am sure, I will discover many more good things about the book, as I continue reading further! Stay tuned folks! Full review of the book coming up very soon!